Are you expecting? It’s time to start thinking about decorating the nursery for the new baby! The Miffy Lamp is a wonderful addition to any nursery for little ones who want to brighten up their life with Miffy; it provides not only some light to see the way but a friendly companion to keep you safe even on the darkest of nights. The Miffy Lamp is available in small or extra-large, with the biggest standing at 80cm tall! You can view it HERE. The Miffy Blackboard is a cute decoration for children of all ages. It’s perfect for goodnight messages, don’t-forget-me lists for mummies that have a lot to remember and for little ones who love to draw. You can view it HERE. The cutest way to keep your books tidy! The Miffy Book Ends make bed-time-stories fun for all the family, and are a perfect addition to a growing book shelf. 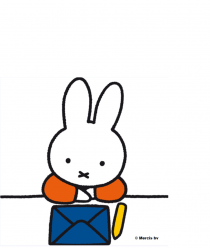 Keep all your stories in order with the help of Miffy! You can view them HERE. Inkeeping with a monochrome theme, this Miffy changing mat has a simple design perfect for a Miffy themed nursery – it’s easy to clean and made with comfort in mind, making changing time that much easier for new parents! You can view it HERE. Give your nursery a traditional touch with an adorable Crochet Miffy. Handmade to high quality this makes a wonderful bedtime toy, available in all sorts of outfits as well as a charming rattle! The Crochet dolls are available HERE while you can find crochet loop rattles and chime rattles HERE. The Miffy Cot Spiral is a great addition to the nursery, providing baby with a little Miffy to keep them company during the night. Its simple design means it is easy to move. You could use it with the car seat or pram to keep little ones entertained on long journeys by bringing their favourite character with them.